Today’s block is designed by Jenn McMillan of Fabric, Ink. Jenn has also developed a product for hand sewing called Sew Fine Thread Gloss that you may find helpful when making this block. Jenn’s block is a horse shoe block which she chose as her block theme because she has fond memories of her family’s horse shoe tournaments at their family reunions in the summer. My fusible applique version of the Horse Shoe Block. I blanket stitched around all the edges with coordinating thread before sewing it into my quilt top. Needle turn applique is is nice option for summer sewing. I too have fond memories of playing horse shoes with family. My Grandfather used to book a cabin for us every spring and fall at his friend’s cabin in Jasper, Alberta. There are horse shoe pits at the cabin so a spontaneous game would inevitably start up every year. If you haven’t heard of playing horse shoes there are metal spikes set in sand pits opposite each other at a certain distance apart. You toss horse shoes and try to ring the spikes with them. Jenn’s block was designed as a needle turned applique block so you have an opportunity for some slow stitching outside in the nice summer weather if you wish. I encourage you to give it a try. I tried needle turned applique for the first time on this block and I am still working on that. Another option for this block is fusible web applique which I ended up using to create the block that went into my quilt top. If you choose to do a fusible block you can still have a chance to hand sew if you want to hand sew your blanket stitches. Or you can use a sewing machine to secure your edges with zig zag, satin or blanket stitches. I created a short little YouTube tutorial video to show how to hand sew blanket stitches on applique. Jenn has tutorial links and her free pattern download on her blog so please visit her there. If you enjoy her post please consider following her blog. She is offering a giveaway too so make sure to enter that while you’re there. You can also follow Jenn on Instagram @jennmcmillan. Daydreams of Quilts enamel pins. 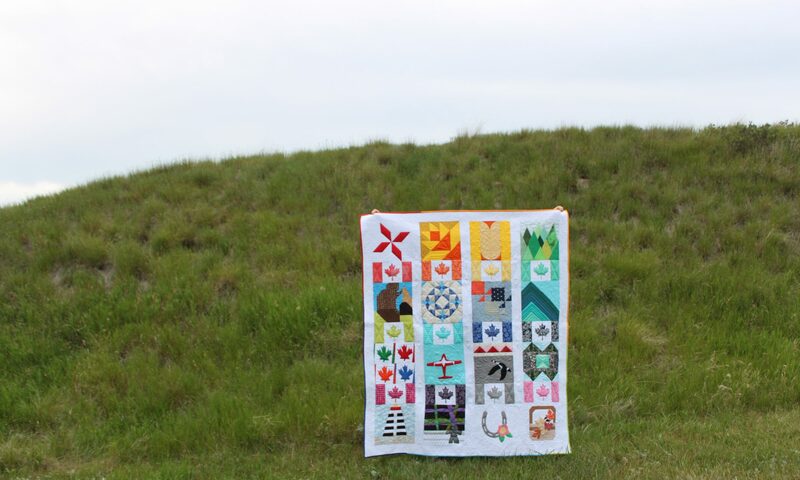 Visit the main Canadian Summer Quilt Along post here at Daydreams of Quilts to see the schedule of upcoming blocks, sponsors and list of prizes for the grand prize at the end. Thank you for sewing along with us!